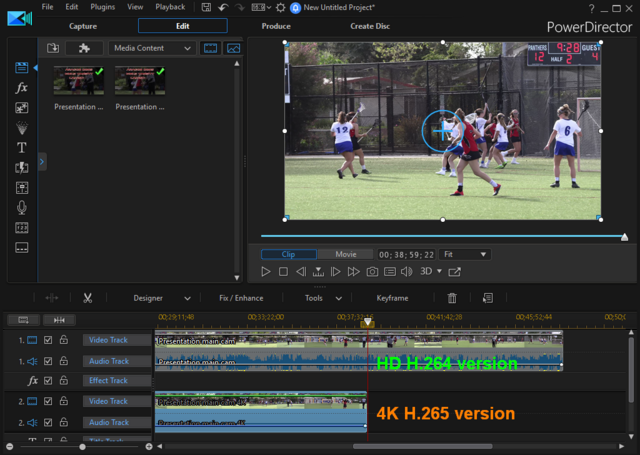 I just got a new Canon GX10 4K H.264 60p camera and was excited to test it out at my daughter's lacrosse game on Thursday. Everything went well, and I produced an HD H.264 version of the 48 minute clip in about 2.5 hours yesterday, then let my PC run overnight to produce a 4K H.265 version since it was going to take 6+ hours. I used a custom profile with a 60p 70Mbps bitrate (attached), and I wanted to use HEVC because the AVC 4K version would have been 50GB. EDIT Apr 15: this issue was due to an error on my part. Further diagnosis is not needed There is no audio, but it's likely that I made a mistake on the timeline late last night. MediaInfo says there's 88MB in the audio track, however, and I don't get any sound from any player (VLC, WMP, Movies & TV w/paid HEVC codec), nor from within PD14 or 17. AudioDirector9 shows a completely blank stereo timeline. Maybe the 88MB is essentially all 0s. On YouTube, there is also no audio, and despite fully processing the clip, the ONLY streaming resolution that appears is 360p! The video quality is excellent on all local players, though. For comparison, full audio and all resolutions are available for the HD version on YT. I've uploaded the clip to OneDrive, so if you have a fast internet connection and/or plenty of patience, I'd really appreciate it if a few people could download it and see if it behaves any differently on your systems. I'm sure that there will be no audio, so I'm really looking to understand the YT and PD issues. I'm producing a 60p HEVC MP4 version now to see if this is another issue that PD17 has with M2TS clips. If that has similar problems, I'll go back and try AVC. Quote I'd really appreciate it if a few people could download it and see if it behaves any differently on your systems. I'm sure that there will be no audio, so I'm really looking to understand the YT and PD issues. Full video in both PD14 and PD17. Snapshot below from PD17, back abit, ~8sec, from the end as you faded to black. I did check out the clip in PD17 and see the same length of 48:10:21 in both the media library and on the timeline. See the screenshot. Edited the audio in AudioDirector. Boosted the audio 96dB and hear only white noise. See this post: https://forum.cyberlink.com/forum/posts/list/78011.page#319689 . There is a link to fixing some no sound on YT. Seem to recall a post maybe in another forum that a contributor had the same problem of no audio in a YT video when h.265 encoding was used. Maybe it is not something that can be fixed. Wait for a contributor’s response on this. There is no audio, only noise in the sound card. jumping around 24GB 48:10 videos with MPC-HC, i found that at 46:59-47:06 and 47:35-47:37 was very soft and it isn't 4K! did you have the shadow files turned on? it looks like PD17 didn't replace the shadow files with 4K HEVC H.265 files. that's why i don't use the shadow files at all. Thanks very much for downloading and testing. Your ability to see the full clip is at odds with what's happening on my computer. I just checked PD13 and it shows the truncated duration as well, so there must be a reason why all PD versions on my system affected while yours aren't. I don't know if it matters, but are you running PD17 v2514 or 2721? If you have VLC installed, can you load this clip and randomly skip to anywhere on the timeline and have it play, or does the video freeze after half a second the first time you try, and then nothing else happens other than the progress bar inching along? I also see the left side counter showing 00:00 no matter where the scrubber is while the video is "playing," but if I pause it, the counter is updated whenever I click on a new location, only to reset to "00:00" when the video "plays" again. Also, YT is only showing 360p for just this one clip, so something clearly went wrong prior to or during the streaming conversion. I can't believe it's unrelated to the issues I'm seeing. Meanwhile, I have no problems with the newly produced and otherwise identical MP4 version, and I expect that it will play correctly once it finishes uploading to YouTube. Whatever's going on with the M2TS clip is still a mystery. Quote I did check out the clip in PD17 and see the same length of 48:10:21 in both the media library and on the timeline. See the screenshot. Edited the audio in AudioDirector. Boosted the audio 96dB and hear only white noise. Thanks tomasc. I am 99% sure that I'm the cause of the missing audio. I probably should have left that part out of my post as I don't want to distract from the bigger issue. So far it looks like only my system is impacted, so I'll have to do some more digging. Thanks very much for testing and for your feedback! Thanks for downloading and testing this! Those spots actually have nothing to do with shadow files, as my new system can easily work with 4K clips. Those sections are soft because I used a wide field view from a co-mounted HD camera to fill in the scenes where I accidentally lost track of the ball. I also had to zoom in ~2x to get the players large enough to reasonably match the main cam view, so the video definitely got fuzzier there. As you can see from the surrounding scenery, losing the ball was really easy to do at that game because the field had no bleachers and I was right down on the sidelines. I was also trying to watch the LCD screen in mostly bright sunlight. 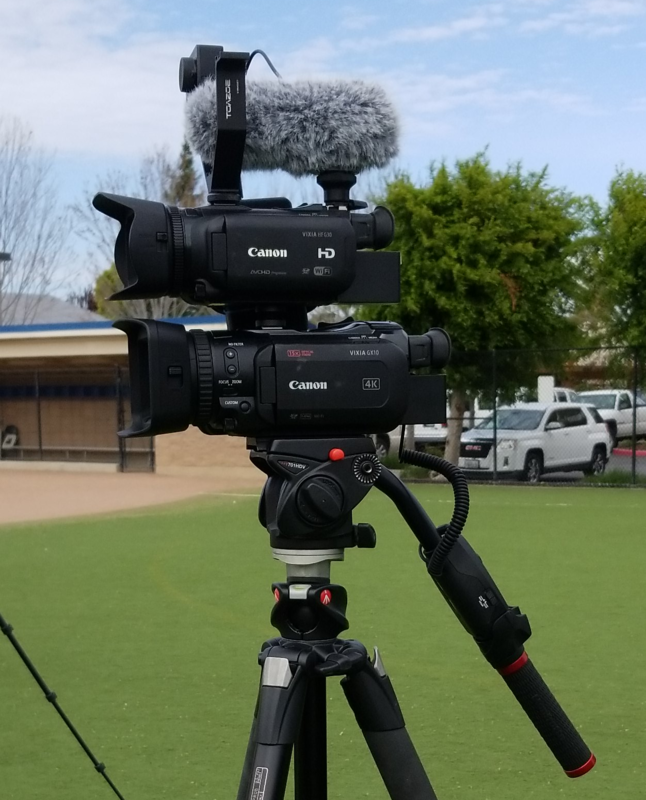 That's a Yi Action+ 4K 60p 155° camera mounted to my HD 60p Canon with a shotgun mic mounted to my new 4K 60p Canon, all on a fluid pan head tripod with a controller arm. The tripod in the background held another HD 30p Canon for the scoreboard. Maybe I've gone a little overboard, but that's what it takes to make comprehensive videos like this! Just a lucky guess. Besides, I figured everybody was getting you tons of Pepsi, so why not go for something different? Late to the discussion & you may have resolved this already, but I just wanted to confirm (as others have) that your video plays the full duration here (00;48;10;21) in every version of PDR I could lay my hands on. Quote Late to the discussion & you may have resolved this already, but I just wanted to confirm (as others have) that your video plays the full duration here (00;48;10;21) in every version of PDR I could lay my hands on. Thanks for confirming, Tony. As everyone else is able to see the full duration, I have reported the issue on ticket CS002012490 to see if tech support can help me understand what's going on with my system. This was my first long video using 4K H.265 and there were a lot of new variables. Up until now, I've usually produced to HD or 4K H.264. Even with similar length videos, YouTube's processing takes less than an hour, so that's something I'll be sure to factor in when deciding how to produce and upload my upcoming 4K projects.